Graves Ledge, or The Graves, is named after English Rear Admiral Thomas Graves (1605-1653), an early settler of Massachusetts Bay Colony who commanded a vessel in Governor Winthrop’s fleet in 1630. 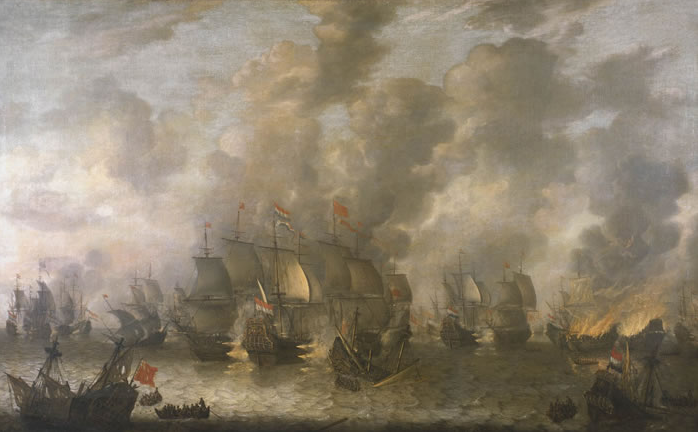 Battle of Scheveningen, 1653, in which Rear Admiral Thomas Graves died from a Dutch fireship attack on his 42-gun vessel. Painting by Jan Abrahamsz Beerstraaten, 1654. Courtesy Wikimedia Commons. Various accounts of this particular Thomas Graves exist. Many are erroneous due to careless research and confusion among several men of the same name. For now, we can safely say the following, based on genealogies and historical accounts. The Thomas Graves for whom Graves Ledge is named was born in Stepney, London, England, a marshy area along the Thames, in 1605. His father was a shipwright. Graves took to sea early, and reportedly first visited Massachusetts as early as 1628. As a young man, he showed excellent seamanship and leadership skills. At age 25, he served as vice admiral of the 11-vessel fleet of Governor John Winthrop in 1630, as master (some reports say mate) of the Talbot. Over the years Graves would crisscross the Atlantic, bringing thousands of English Puritan immigrants to Massachusetts. He captained the first oceangoing ship built in America, the Tryall (Trial) on its second voyage from Boston to England. 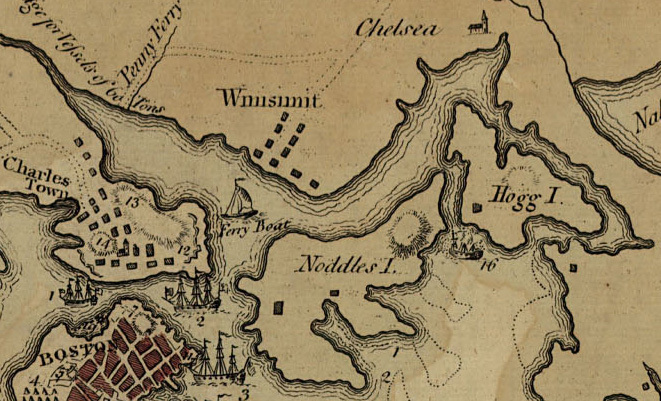 For his service to the colony, he was awarded a land grant of 250 acres that included part of Charlestown and apparently what is now the Lechmere Point section of Cambridge. He brought his family to live in Charlestown in 1636-37. Charlestown had been laid out in 1629 by the other Thomas Graves, an engineer (see below). Frequent trans-Atlantic travel allowed Vice Admiral Graves to maintain contact with leading figures in England. As a Puritan, he would have sympathized with Parliament under Oliver Cromwell, who led the parliamentary forces that executed King Charles I, for whom Charlestown was named. Graves, as a civilian, captured a Dutch privateer off the English coast in 1652. Britain, now a republic under parliament, was in hostile relations with the Dutch, mainly over trade issues and their rival East India companies. In recognition of his courage and skill, Parliament appointed Graves master of the 34-gun ship President. The following year he took command of the 42-gun Andrew (which the Puritans had re-named from the original St. Andrew). He now had the rank of Rear Admiral of the White. Graves commanded the Andrew against the Dutch in the Battle of Scheveningen (also known as the Battle of Texel or Battle of Ter Heidje) of the First Anglo-Dutch War. During that battle, on July 31, 1653 of the old Julian calendar (August 10, 1653 on the new Gregorian calendar), Dutch fire-ships attacked the Andrew, setting her decks aflame. Rear Admiral Thomas Graves of Charlestown, Massachusetts, was burned to death in the attack. His body was buried at sea in Aldeburgh Bay off Suffolk, England, just across the channel from where he died. Some accounts say, without substantiation, that his body was buried in England. Others stretch the tale to burial at sea in Massachusetts Bay, or in Charlestown, but there is no record or evidence of a grave. That year, 1653, Governor Winthrop named the hazardous stone ledges at the entrance to Boston Harbor in Graves’ memory. His widow, Katherine Gray Graves, died in Charlestown on February 21, 1675. Her remains were buried at the Phipps Street Burying Ground, but no headstone remains. Some historical accounts say that Rear Admiral Thomas Graves established Charlestown. Those accounts are not accurate. Another Thomas Graves, an engineer, established Charlestown. That Thomas Graves was a few years older than our namesake, born in 1598 in Gravesend, Kent, England. He was an engineer and town planner. He signed a contract with the Massachusetts Bay Company in 1629. The signatures of the two Thomas Graveses differ (see image). The admiral, less educated, wrote in an archaic Late Middle English script. The top signature is from his will, written in 1652 before the signer went privateering. The will was probated at Middlesex County, Massachusetts, on December 1, 1653. The more educated engineer wrote clearly and in more modern form, using Early Modern English. The modern script – signed on a 1629 contract with the Massachusetts Bay Company – is readable to 21st century readers. Frothingham found original documents containing the signatures of both men, and demonstrated that the signatures were completely different. Thomas Graves, the engineer was of Gravesend, County of Kent, England, signed a contract with the Massachusetts Bay Company on 10 March 1628/9, arrived in New England in July 1629, and laid out Charlestown. Thomas Graves, the engineer, was clearly not the same as Rear Admiral Thomas Graves. In 1629 the engineer already had an impressive reputation for engineering, had traveled extensively, and had a wife and five children. He was older than the 24 years of age that the Rear Admiral was at that time. However, there was somewhat of a connection between the two Thomas Graveses. According to the family history, Thomas Graves the engineer went to Salem, Massachusetts, in 1629, aboard the Talbot, a vessel whose master was 24 year-old Thomas Graves, the future admiral. The Talbot would become part of Governor Winthrop’s fleet in 1630 under the young sailor’s command. “Prince in his Chronology of New England appends the name Thomas Graves, the engineer who laid out Charlestown, ‘after, a rear admiral in England,'” historian Walter Kendall Watkins wrote in an article about the mariner. “This incorrect statement has mis-lead many people,” Watkins concluded. As if the above information didn’t settle things, there remains energetic discussion about which Admiral Graves is the namesake of Graves Ledge. Our Thomas Graves had a contemporary with the same name who was also a ship’s master. He was Captain Thomas Graves, whose wife was also named Katherine, but he was a “gentleman” with the Virginia Company of London who settled Jamestown after a 1608 supply run. Thus his arrival pre-dates our Thomas Graves by two decades, making him the first man named Graves in North America. But Gentleman Graves had no Massachusetts connection. Lord Graves’ cousin, the more senior in rank but less senior in title Admiral Sir Thomas Graves (1747-1814). Because Massachusetts Governor John Winthrop reputedly named Graves Ledge in 1653, before the above admiral Graveses were born, we can safely rule out those admirals. Additionally, Rear Admiral Lord Thomas Graves fought against the United States during the American Revolution, in the un-distinguished Battle of Chesapeake Bay in 1781. He had no known Massachusetts connection. His cousin, Admiral Sir Thomas Graves, also served the Crown against American independence. He does have a Massachusetts connection. As a young lieutenant in 1775, he was the unlucky commander of the brand-new royal schooner Diana, which Boston patriots attacked and destroyed at low tide in the mud during the Battle of Chelsea Creek. Before burning the vessel, the patriots cut off Diana‘s 76-foot main mast and erected it that August, after the Battle of Bunker Hill, as a liberty pole at General George Washington’s headquarters at Prospect Hill (now Somerville, near Union Square). It’s highly unlikely that anybody in Boston would have named a harbor landmark after either of those Thomas Graveses. Footnote: Lots of Graveses here. British Vice Admiral Samuel Graves bought the freshly-launched Diana from a Massachusetts shipwright in January, 1775. He refitted her with 4 six-pound guns and 12 swivel guns and placed it under the command of his young nephew, the future Admiral Sir Thomas Graves, who would lose it four months later at Chelsea Creek, and escape with his men to the HMS Britannia, under the command of his brother, John Graves. Rear Admiral Thomas Graves died in his home – woodbine cottage, Honiton, Devon, England. He owned a mansion in Wilcove (opposite the Naval Dockyard in Devonport, Plymouth UK. This was dismantled and rebuilt as a hotel in Portwrinkle, Torpoint, Cornwall UK. His Naval service can be found on Wikipedia. My family owned a cottage opposite Short Beach in Winthrop, MA. The 10 cottages are no longer there. The salt marsh however has a spectacular view of the skyline of Boston. We used to look out at Graves Light every night. My father having been a seaman (Merchant Marines) probably wished he was out to sea rather than staying home with my mother and 6 kids! Maybe one of the many men named Thomas Graves died in his home in Devon, but the one who the lighthouse is named for died in a naval battle with the Dutch. I’m certain of this – my husband is a direct descendant and how he died is well-known. This information is incorrect, Rear Admiral Sir Thomas Graves who was Lord Nelson’s 2nd in command at the Battle of Copenhagen in 1801 and built Woodbine Hill near Honiton was the cousin of Admiral Lord Thomas Graves who was Lord Howe’s 2nd in command at the Glorious 1st of June and lived at Thanks House Torpoint near Plymouth, which was enlarged by the 4th Lord Graves, before being moved stone by stone to become the Whitesand Bay Hotel at Portwinkle…. The reason that I know this is because Sir Thomas Graves eldest brother Rear Admiral Samuel Graves was my gt.gt. gt. grandfather and his son John Graves lived at Woodbine Hill after the death of Mary Graves the only child of Sir Thomas. Molyneux, this Rear Admiral Thomas Graves was born in 1605, so maybe the information you’ve kindly provided could be useful elsewhere. Miller, I agree – Many people are named “Thomas”, “Graves” is not too rare, either, nor was the title Rear Admiral back when England moved to America. I am also a direct decendent of RA Thomas Graves, and have heard very similar such stories of him with historical evidence confirmed through actual documentation, not from Wikipedia. Mr. A. Grave’s, Wikipedia is not a citable source, as anyone has access to editing it’s contents. And Miss Dominico, thanks for sharing, what a nice image and feel. I am not a historian myself, nor was I there, so I cannot say for fact what happened. I do enjoy my families stories, nevertheless, and feel excited when it’s matched by another – all the shuffle is what makes things interesting and special per individual, but not when intolerance is an issue. Happy studies, all. Molyneux, this Rear Admiral Thomas Graves was born in 1605, so maybe it was another. Family names are annoyingly overused, especially back then. Miller, I agree – so many people share the same name, especially back then I am also a direct decendent of RA Thomas Graves, and have heard very similar such stories of him, to which historical evidence was confirmed through actual documentation, not from Wikipedia. Mr. A. Graves, Wikipedia is not a citable source, as anyone has access to editing it’s contents. Again, it may be yet another “Thomas”, which is fine. Thank all of you for your comments. I’m the webmaster of GravesLightStation.com, and a historian who has researched the Thomas Graves discrepancies for several years. Granted, there were many English men named Thomas Graves, two or three of whom settled in Massachusetts and Connecticut in the first half of the 1600s, and others of naval flag rank in subsequent centuries. There is no doubt that the Thomas Graves for whom Graves Ledge was named is the rear admiral who, as a young sailor, first visited Massachusetts in about 1628, mastered the Talbot as part of Governor Winthrop’s fleet in 1630, and died at sea in combat with the Dutch in 1653. He was the son of a shipwright and took to sea at an early age. His handwriting shows an archaic script that clashes with the more modern script of the elder and more educated Thomas Graves, the engineer who laid out the town of Charlestown. The seaman of Charlestown was a Puritan who sided with Parliament and Oliver Cromwell in the English Civil War. His only military service was under Cromwell. He never would have been in a position to accept or receive a title from a king. That eliminates him from other admirals named Thomas Graves who are mistakenly considered the namesakes of Graves Ledge. Admiral Lord Thomas Graves lived from 1725-1802. He received an Irish peerage title, First Baron Graves, after being wounded in the Battle of the Glorious First of June in 1794. Lord Graves also fought against American independence during the American Revolution in 1781 at the Battle of Chesapeake Bay, so it’s very unlikely that anyone in Boston would have named anything after him. Admiral Lord Thomas Graves’ father was Rear Admiral Thomas Graves. His first cousin, once removed, was Admiral Sir Thomas Graves (1747-1814) who, as a young officer, commanded the HMS Diana that Boston patriots attacked in 1775 at the Battle of Chelsea Creek. He saw further naval service against the American cause through our war of independence. He would later serve under Rear Admiral Horatio Nelson in the 1801 Battle of Copenhagen. The chances are slim to none that Bostonians would have named the ledge after him. As a Puritan and a supporter of a British Republic under Oliver Cromwell and Parliament, our Thomas Graves would not have held the title “Sir” or “Lord,” which were royal titles. Still, we appreciate the discussion. We welcome people to continue to use this page to discuss the issue, but as far as we are concerned, the matter is settled. Thank you again for visiting GravesLightStation.com.